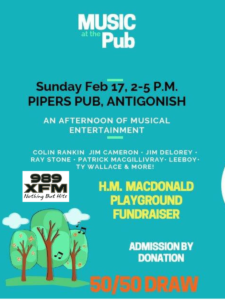 Music at the Pub is happening this afternoon in support of the H.M MacDonald playground fundraiser! Join for an afternoon of musical entertainment by Colin Rankin, Lee boy, Ty Wallace and more. Admission is by donation and there will be a 50 50 draw. All money raised today from 2 until 5 will go to help build a new playground for H M MacDonald school.